The Drouin Institute’s miscellaneous collections contain a mix of images, documents, books, pictures and directories of historical and genealogical significance. Fonds d’archive (Archival fonds): Contains various archival fonds obtained from different sources and authors. Archives municipales (Municipal archives): Contains the municipal archives of multiple Quebec cities. Can be browsed by city or by type of document. Dictionnaire Jetté: The Jetté dictionary is a genealogical dictionary published in 1983. It covers the Quebec population of French origin. PRDH: The original 47 PRDH volumes, which contain all Catholic baptisms, marriages and burials from Quebec for the 1621-1765 period. 300 000 records in total. Autres documents (Other documents): Contains various archives and documents of historical and genealogical interest. Lignes de vie (Lifelines): Contains lifelines organized by family name. Journaux anciens (Old newspapers): Contains digitized old newspapers. 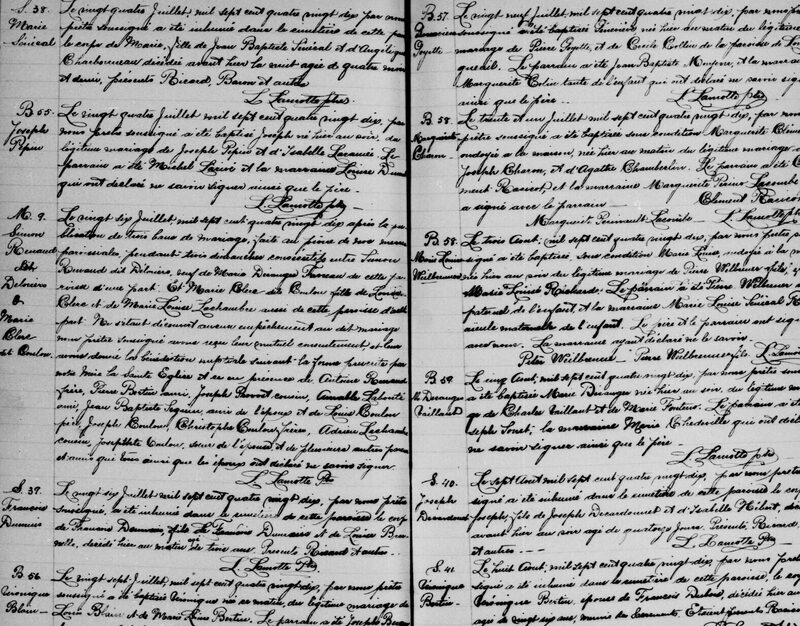 Statuts de la province de Québec: A variety of legal documents pertaining to adoptions, name changes and inheritances. The documents are sorted by the subject’s family name. This section is organized in a file tree. The names of the folders are used to identify and describe their content. You can browse the Drouin Institute’s miscellaneous Collections with a subscription to Genealogy Quebec at this address.